After spending the previous day travelling north to get in place for the next weather set up, we woke up in Castle Rock, Colorado, which is just south of Denver. The forecast for this day would prove to be fairly challenging due to the lack of upper level wind support. Similar to our first day of chasing, we would end up chasing a pocket of 500mb level winds. Models suggested that the best upper level wind support would occur in northeastern Colorado where a shortwave trough was also located. A surface low in northeastern Colorado was expected to become more organized and aid in the enhancement of the veering wind profile for this area. Storms were expected to fire along a dry line located in eastern Wyoming and central Colorado, which would progress eastward throughout the day. We targeted Bush, Colorado where we thought we would stand the best chance of seeing a nicely structured storm. Once we made it up to northeastern Colorado, we stopped at Taco Johns in Fort Morgan for lunch and waited for storms to begin initiating. We noticed storms were beginning to initiate in southwestern Nebraska so we travelled north to chase one of these storms. We went as far north as Kimball, Nebraska until we realized the storm was beginning to fizzle out. We noticed new storms beginning to fire along the dry line in northeastern Colorado, so we turned around and headed south back to Fort Morgan. Once we made it back to Fort Morgan, we hung out at the park and kept an eye on the storm as it made its way toward us. This storm quickly congealed into a multi-cell cluster of thunderstorms, becoming fairly disorganized. 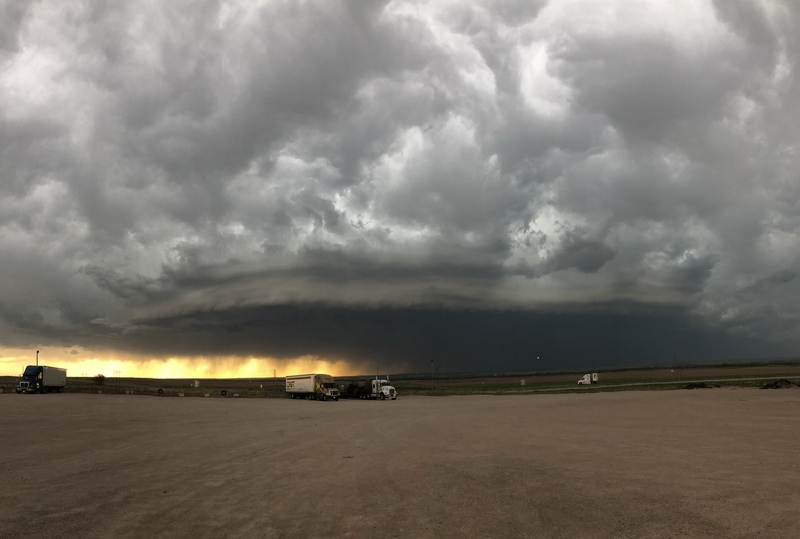 We made our way up the road to a gas station in Crook, Colorado where we observed a shelf cloud associated with this storm. From there we went to an abandoned gas station up the road in Sedgwick, Colorado where we ended our chase watching a beautiful sunset along with an amazing lightning show! These storms may have not turned out as we had anticipated, but they were very neat to watch! We were able to take many great pictures of these storms over the several hours we chased it. We look forward to seeing what else is in store during our storm chase! This entry was posted in Kentucky Weather and tagged Colorado, nebraska, severe weather, Storm Chase. Bookmark the permalink.